Glucose uptake is an important biological process for studying cell signaling and glucose metabolism. Among many different methods available for measuring glucose uptake, 2-deoxyglucose (2-DG) has been widely used because of its structural similarity to glucose. As with glucose, 2-DG can be taken up by glucose transporters, and metabolized to 2-DG-6-phosphate (2-DG6P). 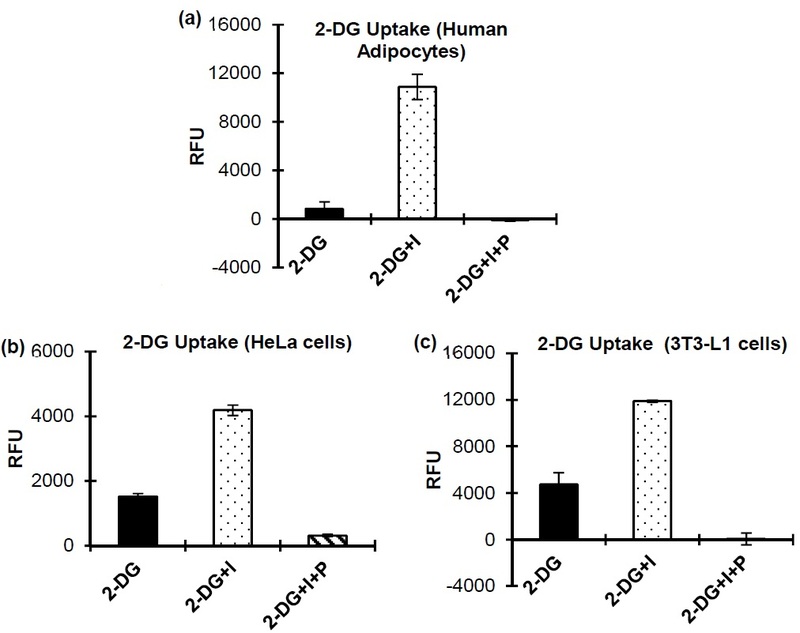 2-DG6P, however, cannot be further metabolized, and thus accumulates in the cells. 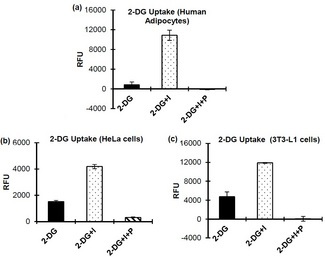 The accumulated 2-DG6P is, therefore, directly proportional to 2-DG (or glucose) uptake by cells. In The glucose uptake fluorometric assay kit, the accumulated 2-DG6P is enzymatically oxidized and coupled to The PicoProbe, which generates fluorescence in the presence of NADPH. This easy to use non-radioactive kit can detect glucose uptake as low as 50 pmol/well and can be used for a variety of cell types. This easy to use non-radioactive kit can detect glucose uptake as low as 50 pmol/well and can be used for a variety of cell types. (a), (b) and (c) 2-DG uptake in human adipocytes, Hela Cells and 3T3-L1 cells respectively. Assays were performed following kit protocol. I = Insulin; P = Phloretin.